The concept of take-out food can be traced back to Ancient Rome and Ancient Greece, it was common for people to buy prepared food from market and roadside stalls. In the ancient Greco-Roman world, poor people could not afford a private kitchen in their house, so eating, or at least cooking, at home was highly uncommon. Poor people usually ate outside and would purchase their food from the local thermopolium. 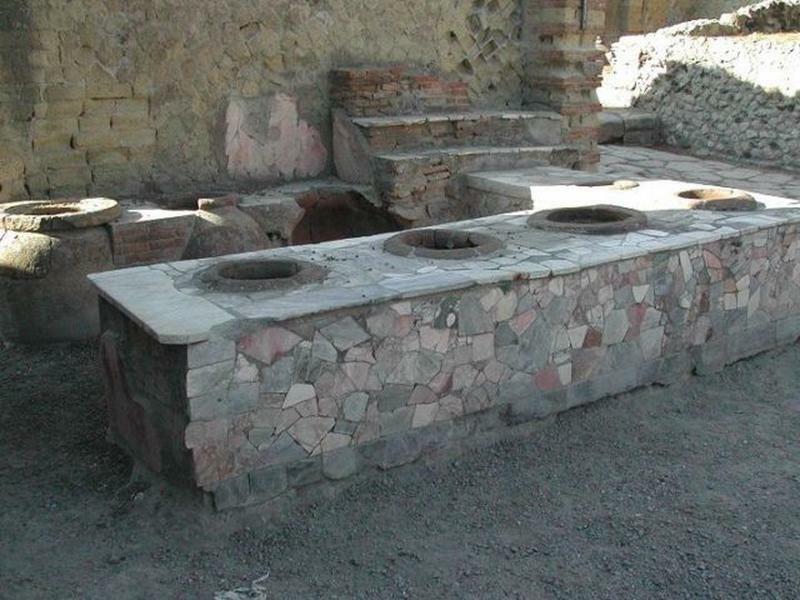 The thermopolium was an ancient form of a take-out restaurant, an outdoor service counter that offered ready to eat food. 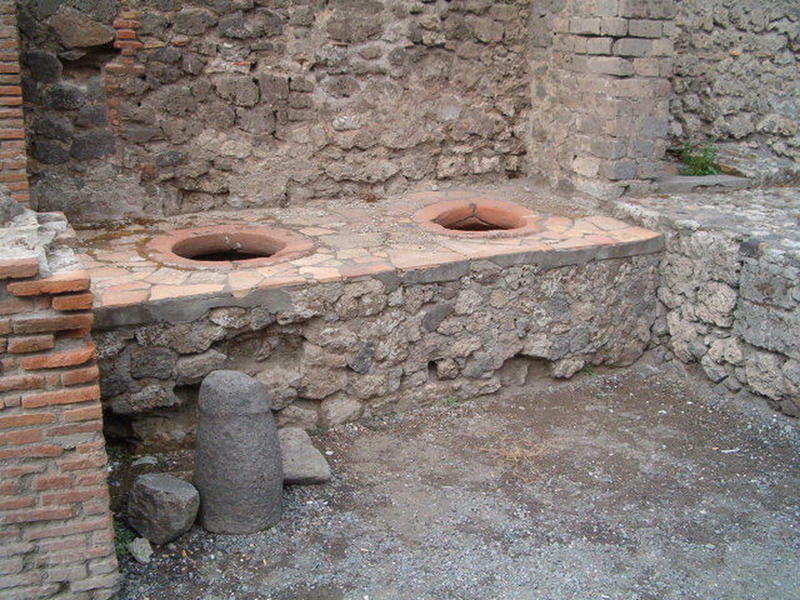 The word thermopolium literally means “a place where something hot is sold”. It consisted of a small room with a stone counter at the front, in which several terracotta jars called Dolia were embedded. These jars were usually used to store dried food like nuts, because hot food would have required cleaning out the dolia afterwards which would have been very awkward. The fancier thermpolia were adorned with traditional frescoes. Over the years, archaeologists have discovered a number of thermpolia in Pompeii and Herculaneum, two towns that were destroyed (and preserved) by the eruption of Mount Vesuvius. In one thermopolium, the remains of cloth bag containing around thousand coins was discovered in one of the dolia; this almost certainly demonstrates the popularity of the establishment. 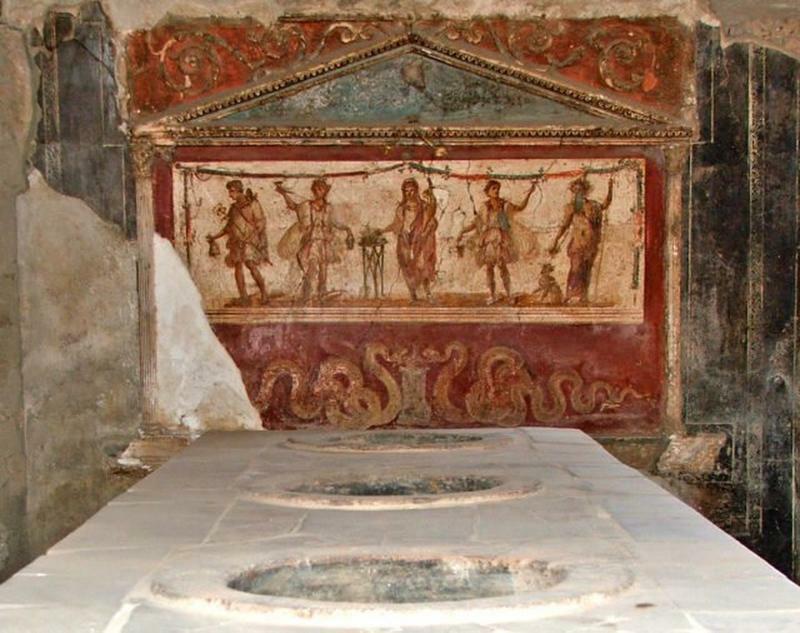 One of the most complete examples of a kind of establishment in Pompei is The Thermpolium of Asellina, which was discovered with complete jugs and dishes on the counter, along with a kettle filled with water.